for $324,900 with 3 bedrooms and 2 full baths. This 1,747 square foot home was built in 2019 on a lot size of 80 X 80 X 125 X 125. The Johanna by Beattie Development. This beautiful new pool home in SW Cape Coral features clean modern lines, 9'4" ceilings throughout the home with a 10'4" tray ceiling in the great room. From the moment you pull on to your pavered drive this home will impress. 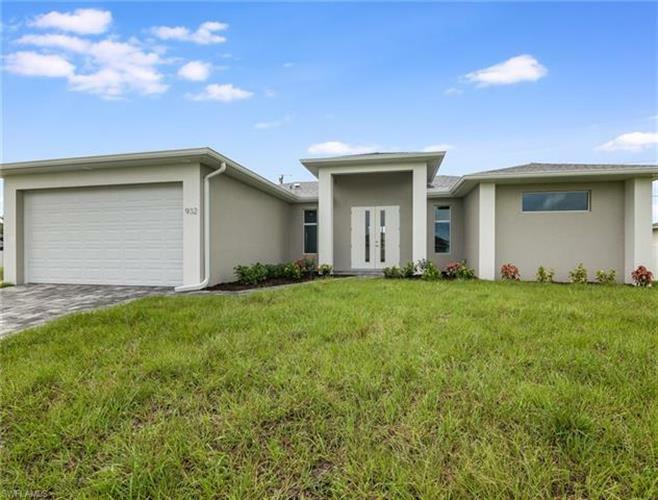 The interior features granite countertops, beautiful cabinets, tile throughout the home plus many other upgrades. From the great room you can step out to your sparkling pool and nice sized back yard. Irrigation with Bahia grass & Stainless appliances are included. This home is in a great family friendly neighborhood with western rear exposure close to shopping & entertainment. Come home today to your new Beattie Development home today.Option to purchase home without pool as pool construction has not yet started at $284, 900Photos are of another home.